Picnic At Marina: Ravioli "Love Letters"
When I bought a ravioli maker, a new addition to my little kitchen, I had to put it to test right away. I made a dough, and went to pick up the teenager from school. When we came home, his first question was: "What are you going to do? Not the ravioli on a week day?!" See, the reason he was surprisingly confused was that we usually make ravioli on weekends, when we all gather around the table, tell stories, while filling the dough and shaping it into something resembling a traditional ravioli. "Don't worry", I told the teenager. "I will make it myself, quick. Look what I've got! ", and I proudly pulled the new ravioli maker out of a cupboard. "If you say so", was his still suspicious reaction, and he went to do his homework (I think that's what he did. I hope). The dough after 30 minutes resting looks silky and is smooth to touch. I prepared everything on my little kitchen table, and rolled the dough. Everything went so smooth: the dough had time to rest and was elastic, easy to roll, just perfect. A first layer of pastry went on the ravioliera, then each hole was filled with a filling, covered then with another layer of dough. I haven't spent even five minutes, and I already had 12 raviolis. Almost. How little did I know! 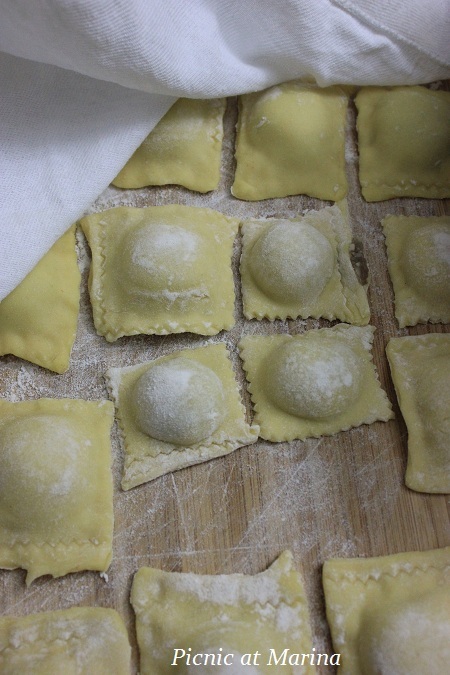 When I started to roll the pin over the top to press and cut ravioli, I understood that I am in a little trouble there: apparently, I put too much filling in each hole. As I was pressing, I also was pushing the filling into another hole and all over the sides of the dough. I stopped, and called the teenager. Skipping the details of our conversation, which was quite fun, we cut each ravioli out of the press with the knife, and finished it by hands. They looked quite different from the one's pictured on the box, but edible. The next batch came out better, and by the third batch I figured out how much filling I had to put in each hole to make ravioli worth picture taking. When the dinner was served, the husband came out of the office, smiling and holding a letter in his hands, a letter, that I wrote to him just a few days ago, just because it's a holiday season and I was all romantic and sentimental to put a few words on a piece of paper. And then it just hit me as I was looking at the letter and those rectangular shaped ravioli: they looked alike! A Love Letters Ravioli! Combine all the ingredients and make a nice silky dough. I use stand mixer for the mixing task, then I knead the dough for about 7-10 minutes. Then I always let the dough rest wrapped in plastic film for 30 minutes. Then give the dough another knead, and start working. Divide the dough into 4 pieces, shape it into a fist size balls, and cover to prevent from drying. 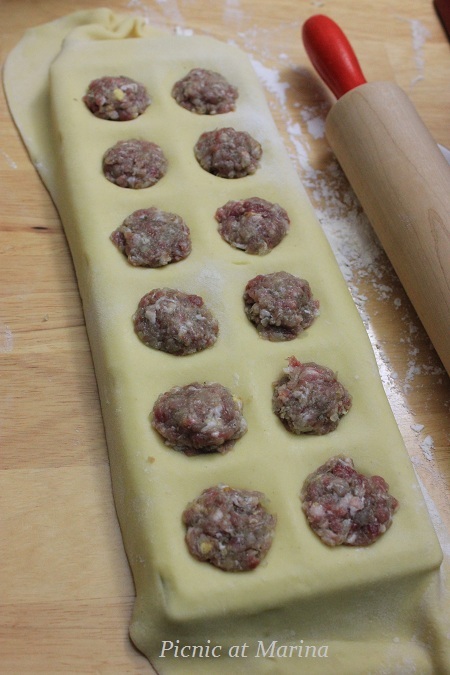 Work with one cut at the time: roll it into a thin sheet size of the form, place on a raviolera, fill each hole with filling just a little bellow the edge of the hole. 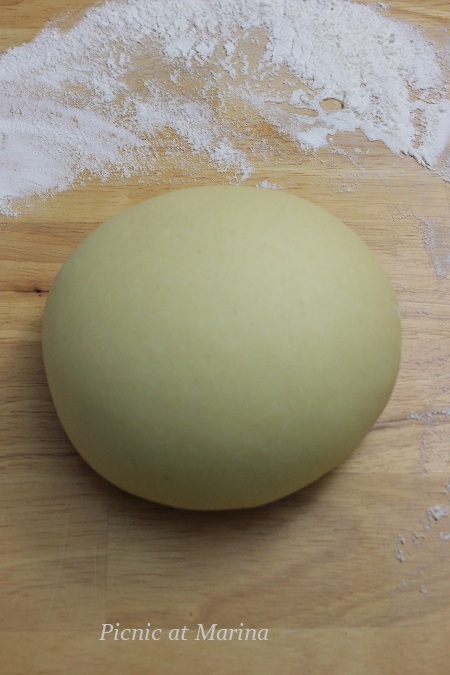 Cover it with another layer of rolled dough, and press with the rolling pin. Overturn the tray to remove the ravioli. Keep a small bowl with flour on your workplace to dust the table/board, rolling pin, and form. Now, there are as many opinions about how long to boil raviolis as there are ravioli makers, or eaters. Because this raviolis have raw meat filling in it, I make sure it's done by cutting one raviolo after about 3-4 minutes of boiling. We don't like our pasta overcooked, and as soon as filling is done, usually the pasta is also done. Although it does depend on how thick was the dough rolled, and on the size of ravioli. * If semolina flour is not available, use all purpose flour. Using the semolina flour is our preference. * You can make raviolis with any filling you wish. You can also pre-cook your meat filing by sauteing all ingredients in the skillet. The above filling is one of my men's favorite. We grind our own meat, and finish grinding with the onions, which gives a lot of flavor to the meat. Any other meat or meat combination can be used. Just experiment what you like the best. * You don't have to have ravioli maker, you can perfectly shape ravioli by hands. * How thin to roll the dough for ravioli? Again, there are numerous opinions, or tastes, I shell say. Paper thin is a classic, but we like a bit more pasta in our ravioli, so I roll it about 3 mm (1/8 inch) thick. * How many ravioli to cook at one time? I cook 12-15 large size or up to 25 very small ravioli, dropping 3-4 at a time. * Sauce or not to sauce ravioli? It is very personal, really. In our family everyone has their own way of eating ravioli: the teenager likes it with red sauce; the husband likes it either with no sauce or a little starchy water it was boiling in with butter and parsley; I can have it with a white sauce or just plain with a little pecorino romano cheese and herbs, and a drizzle of olive oil on top; our daughter likes it with a white sauce. About realizing trouble:) We have all been there..about the letter to your husband..how dear:) and about the whole feast.. They look great to me..
Homemade ravioli are so nice! I have a ravioli attachment for my hand pasta maker, but it's kind of a pain to use. So much better to use the molds like you did. I usually fill my ravioli with either a cheese mixture or a mix of greens (usually Swiss chard) and seasonings (sometimes there's a bit of pancetta in there, too). Nice post - thanks. I have never got my ravioli cutter thing to work - but now that I've read this I will have to give it another go. I suspect the amount of filling was my problem too. 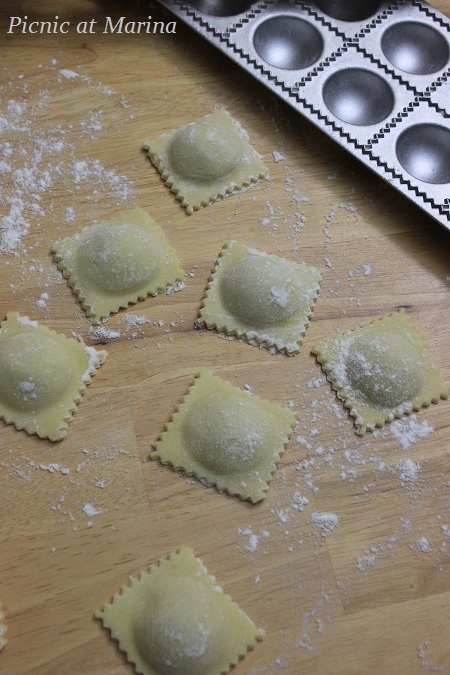 Hi Marina, now that's one really cool ravioli maker, awesome post! Here's wishing you and your family the very best this Christmas! Very impressive Marina! I rarely make my own ravioli these days. It is hard work but boy, they are so incredibly tasty. Well done Marina! Thank you for sharing such a nice post. And recipe. Nice little storie about the letter... Your raviolis are beautiful... Every time I use my ravioli maker, the first batch looks terrible and after, it's perfect! Looks amazing! I have never made fresh pasta before but I think I need to try. Delicious !! That's how we gain knowledge, from our errors. Glad you mastered the process, ravioli sure look professional. Ooh, these look DELISH, Marina! 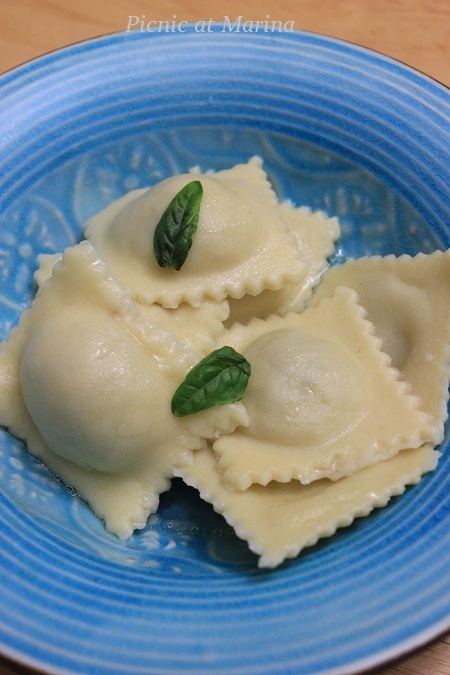 I've only made ravioli like these once, but my pasta was too thick...and I wasn't pleased with the results. Time to give them another shot...the picky daughter would be thrilled. PS...I'm so sorry you've had trouble getting to my blog. I am very touched you stuck with it...and hoping as I get more hits, it will soon be a seamless process. Thank you, my friend. 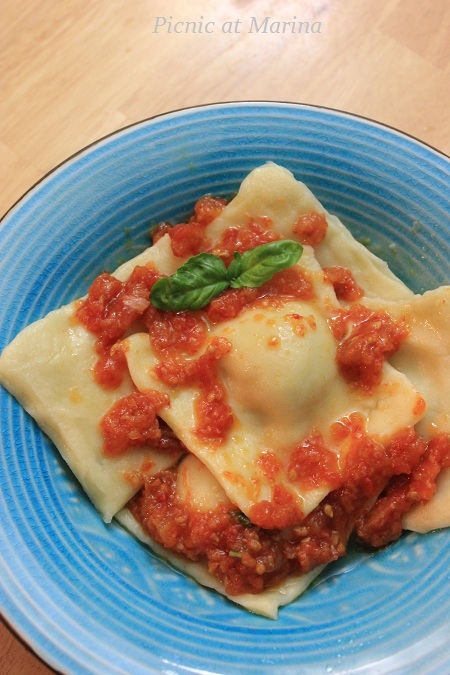 Gorgeous, those raviolis (even the first batch) are picture perfect! Bellissimi Marina!! I need to buy a similar tool!!! I love your filling, men in general like a meaty filling (I've got 3 BOYS in my house!!) I prefer spinach and ricotta cheese... Happy Holidays! Great post, Marina! Aren't these dies great? I've a few of my own. Your step-by-step instructions using them will help many to overcome their fear of making these tasty pasta pillows and your filling recipe sounds delicious. Our ravioli making is now done a couple times each year. I'll help Zia and we'll fill her freezer until the next time. Afterwards, I'll come home and repeat the process for my freezer. In our homes, it wouldn't be Christmas without a platter of ravioli served at Christmas dinner. Speaking of Christmas, I hope you and your family have a wonderful Christmas, Marina, and every happiness in the New Year. Calling by to thankyou for your support of my blogging over the last year, I love the fact you wrote your husband a little love note. Meanwhile I wish you a wonderful Christmas season and hope you will have time to call by and listen to the music on News From Italy over the holidays. Marina, your ravioli look stunning. Even the step-by-step photos look as if taken from a professional cookery book. I am seriously impressed because I have never had the courage even to try making ravioli on my own. They look pretty. I have never made them. I have never made homemade pasta, but my girlfriend swears that it's so simple and so good that I will never go back to the boxed pasta again once I try it. I'm going to attempt to try and make yeast breads along with pasta this year! I love how you and your family get together, make pasta and chat on the weekends. What a great memory! I have pasta machine for some time, but I am on the diet and did not have a chance to try it yet. Ravioli look so delicious! You are very talented cook!